Commercial kitchen flooring must be able to cope with all of the different wear and tear that is thrown at it, notably the heavy and regular foot traffic of chefs and kitchen porters moving around across the surface. Durable resin is a good starting point to provide a smooth, seamless surface that will not crack or peel over time, unlike most stick-on floor coverings like vinyl. It helps to reduce trip hazards both now and in the future, and can be used throughout your building and into outdoor areas, if you want a consistent floor through to delivery zones and storage areas. Commercial kitchen flooring must also cope with specific hazards like water spills, cooking oil and grease, and the full range of industrial cooking equipment that stands on top of it. Primer layers can give an extra barrier against oil or moisture, while extra grip can be added using aggregates in the resin mix – ideal for floors that are likely to become greasy or slippery on occasion. Smooth surfaces throughout commercial kitchens and surrounding areas. • Can be used on ramps and slopes – for example in delivery zones. • Textured resin gives extra grip in greasy conditions, protecting staff safety. • Primer layers can resist oil and damp, prolonging the life span of the floor in good condition. 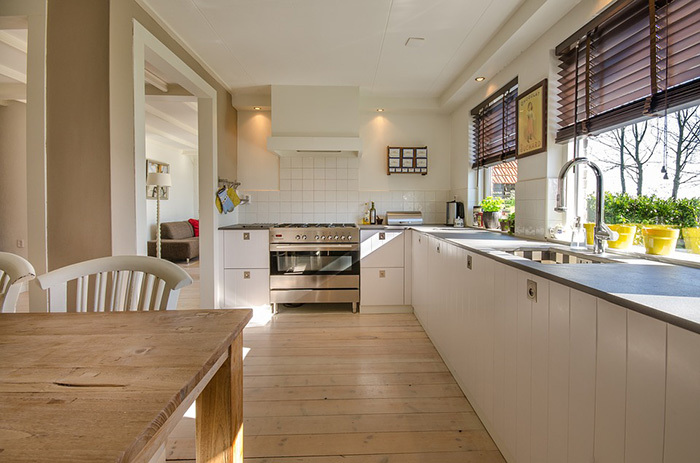 A working kitchen needs a functional floor as fast as possible, and our speedy but thorough installation process will give you the best quality of finish without wasting any time unnecessarily. We can visit your premises and advise on any specific types of industrial flooring or sub-surface and top surface treatments. Our standard floor preparation process cleans the current surface and roughens it up, making for a better bond with the poured resin. Where cooking equipment cannot be removed easily, we may be able to work around it, as poured resin can be used in awkward locations where solid surface coverings could not easily be installed. Our commercial kitchen flooring is hygienic and quick to dry, giving you a functioning kitchen as soon as possible, with all of the benefits of your new resin.